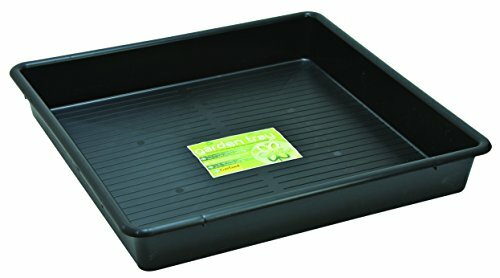 With a depth of 5 inches and a large internal capacity of over 20 gallon, this 31.5 inch Square Tray features a series of shallow horizontal ridges on the internal base of the tray which aid drainage from potted plants. Besides gardening, the tray is equally useful as a commercial drip / spillage tray for oils and chemical storage, a sand pit for kids, and a mixing tray for cement to name a few. Trays of this size and strength are very hard to find. Made from recycled polypropylene! Tierra Garden is an importer, designer and manufacturer of distinctive garden products that has developed a reputation for quality products and a broad selection of unique garden hard goods. View More In Germination Trays. If you have any questions about this product by Tierra Garden, contact us by completing and submitting the form below. If you are looking for a specif part number, please include it with your message. © 2019 - aquaponicsinparadise.com. All Rights Reserved.